Cranberries aren’t just for Christmas anymore. 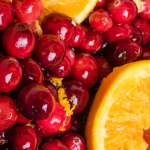 There is something about these winter fruits; cranberries and oranges that create a party on my tongue! I LOVE Cranberry Orange muffins at Christmas but alas, they must remain treats. So I thought, how could I get this same flavor in a healthy veggie salad? Raw Cranberry Orange Salad Dressing. I found the answer on Happy Raw Kitchen and just made a few tweaks to reduce the sugar content and add a bit more ZING! http://thehappyrawkitchen.blogspot.com/2009/12/berry-festive-wreath-salad.html Most Raw Cranberry dressings use a TON of sugar (2-4 grams per serving) but this one only has 1.17 grams (notice it is one-point-17 grams) per Tablespoon. Yay! This is incredible with a Kale salad, add some more raw cranberries, oranges, walnuts and a tablespoon or two of feta for an incredible alkaline meal. You could also add some of your leftover holiday turkey, or pick up a few chunks of Boar’s Head Roasted Turkey (I use Boar’s head because they don’t use MSG and it is gluten free and tastes great). When I want to add turkey to a salad I purchase a quarter pound chunk and cut it into bite-sized pieces. Toss it all in this amazing Raw Cranberry Orange Salad Dressing. Why use raw cranberries instead of dried? SUGAR! Sugar is the devil! 4 Tablespoons (1/4) cup of the popular brand of dried cranberries has 29 grams that is TWENTY NINE GRAMS of sugar (over 7 teaspoons of sugar) and 33 grams of carbs. If you are trying to keep your sugar under 40 grams and eat low carb you are already toast! Of course, raw cranberries are tart and take some getting used to if you were going to throw back a handful like you do the dried version…but the difference is enough to create some significant fat loss and you’ll love the sweet and sour effect with the oranges. Dried Cranberries have reduced antioxidant qualities, however frozen and fresh are antioxidant powerhouses with over 2 dozen different identifiable antioxidants. Synergy! Cranberries create an antioxidant synergy, meaning they actually increase the overall antioxidant activity, giving other antioxidants a boost. Combining with oranges, another high antioxidant food, synergistically increase the repair/protect function of the phytonutrients in the orange. UTI? Cranberries keep bacteria from adhering to the walls of your urninary tract. Oranges are high in vitamin C, giving your body what it needs to fight infection. 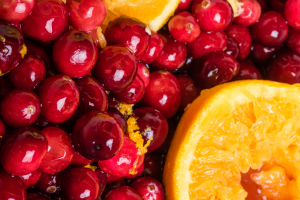 Other Benefits: Cranberries and Oranges are high in fiber and help with digestion, lower “bad” cholesterol (LDL), increase good cholesterol (HDL) and balance triglycerides. They also increase the beneficial Type B LDL cholesterol and decrease the Type A non -beneficial LDL cholesterol. Cranberries are high in Vitamin C, Vitamin E and Manganese, a mineral which helps to support overall detoxification with Super Oxide Dismutase (aka SOD). Oranges are high in Vitamin C, Potassium and calcium, also helping to improve your cardiac system function, lower cholesterol and stabilize heart rhythm. Orange peel also contains considerable amounts ofcalcium, copper, magnesium, vitamin A, folate and other B vitamins and dietary fiber. They have an intense orange and bitter flavor, but the latter is often a clue that a food is healthy; the bitter taste is the result of the many flavonoids that orange peels contain. A Microplane is a VERY sharp small handheld grater for testing citrus fruits and grating hard cheeses like parmesan reggiano. This looks like a cool one…save your knuckles! Use your favorite leafy greens, some other brightly colored antioxidants such as colored peppers and red onion. Toss on some toasted walnuts, a beet if you like and some roasted butternut squash. Toss all in this yummy dressing. Remember to measure your dressing, 1-2 Tablespoons per large salad is all you need if you toss it well…or you can always use the “dip your fork in the dressing” method. Sprinkle with Red Pepper Flakes for a bit more zing. If you use a good high quality, high polyphenol count olive oil you will greatly increase the repair/protect antioxidant and anti-inflammatory properties of this food. Read the full article, How To Pick Olive Oil. Learn more about healthy olive oil. 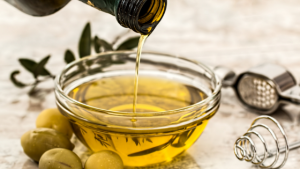 Seriously, damaged oils and fats are a huge health hazard so find a good source for a high quality olive oil and only buy small bottles at a time. If you like Cranberries, check out some other great Cranberry recipes on my site! A wonderful tart-sweet dressing with the zing of orange zest to compliment your winter salad greens. This dressing not only tastes fantastic but has a ton of health benefits. Grate zest from one orange, set zest aside and put orange in blender. Peel 2nd orange, add to blender. Add all ingredients to blender, except olive oil and fresh thyme sprig and orange zest. Blend well, until orange is pureed. Mix melted coconut oil and olive oil together and slowly add to blended fruit mixture, 1-2 pulse on blender until well blended. Add orange zest, pulse 1-2 times. Store in refrigerator up to 7 days. Best if served at room temperature.